Crossing Ebenezer Creek is a poignant historical novel about the meaning of freedom and the heartache of dreams. In it, Tonya Bolden has woven a haunting Civil War tale. The novel starts with an eerie reference to ghosts, ghosts that haunt Ebenezer Creek with strange sounds that howl through the cypress trees. After this ominous opening, the tale moves quickly into the freeing of Mariah and her brother, Zeke—though the moment is far from the black-and-white, momentous celebration that one might expect. Instead, Mariah and Zeke join Sherman’s march through Georgia as Mariah dreams of starting a new life, a life that perhaps might include the mysterious young black man, named Caleb, who accompanies them. The novel maintains a rhythmic prose throughout, with a steady beat to paragraphs and sentences that can at times be choppy, but which is always part of a unique, understated style in which Bolden chose to tell the story. The climax of the story, drawn from historical events, is terrible and riveting, somehow feeling both surprising and inevitable. At stake is Mariah’s dream for a family and an acre of land, a dream that at times seems hauntingly attainable, and at times desperately far out of reach. 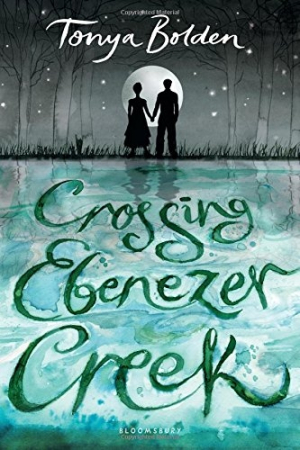 Crossing Ebenezer Creek is a poetic, lyrical novel that delivers its message through a heart-wrenching story; it is not for readers looking for neatly packaged justice or perfect happy endings. Instead, it’s ideal for readers looking for the grit of a historical novel, readers who are also looking to feel the maximum emotions of that age.